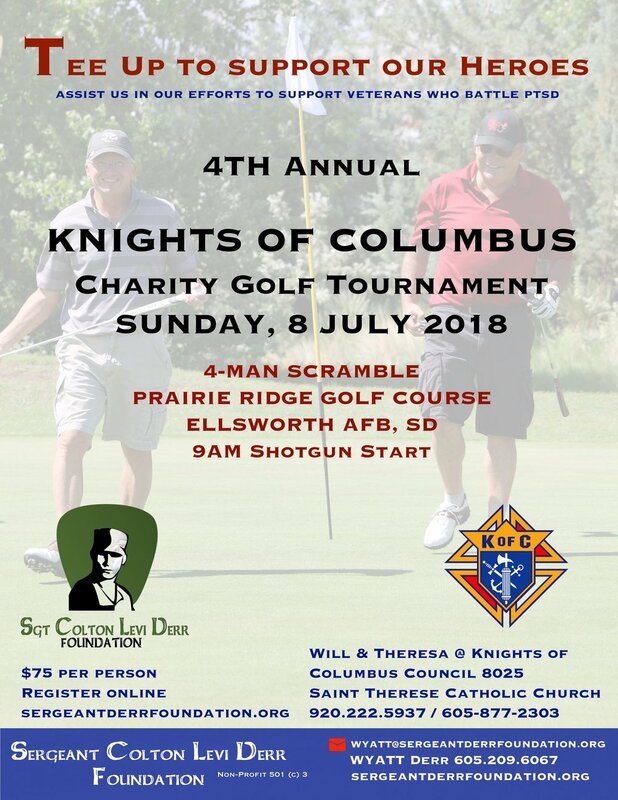 Sergeant Colton Levi Derr Foundation (SCLDF) announces its participation in the Knights of Columbus St. Therese Council 8025 charity golf tournament in support of veterans on Sunday, July 8, 2018. The charity golf tournament will be held at Prairie Ridge Golf Course, Ellsworth AFB, SD . Tournament to start at 9 a.m. The tournament will be a 4-man scramble. Proceeds to benefit SCLDF. Please register by filling out the form below. Only one member from each team will need to complete the registration form. Please make all checks payable to Knights of Columbus Council 8025 and mail them to 518 6th Street STE 5, Rapid City, SD 57701. Or notate in the message field if you would like to pay with cash or another method, and we will work out arrangements with you. We look forward to having you join us! Please list all four participating golfers. Thank you for joining us on July 8th! We look forward to seeing you and your team and are excited to have you with us!